Training is the process of preparing men and women for their careers in the military. Military training is progressive and continues all the way through an individual’s career; being a mixture of mandatory, optional, individual and collective training and educational programmes. The purpose of Phase 1 initial military training is to turn civilian recruits into partly-trained soldiers and includes the Common Military Syllabus (Recruits) (CMS(R)) which lasts for 14 weeks. The British Army’s Phase 1 initial military training produces fit, motivated individuals capable of carrying out local protection tasks in any operational environment. Those who pass are fully prepared to embark on the next phase of their Army training. This article is divided into nine sections for easier reading with part one providing some background information, whilst section two looks at the organisation of training in the British Army. Sections three, four and five look at Junior Entry, Standard Entry (Non-Infantry) and Standard Entry (Infantry) soldier recruits respectively. Section six focuses upon Commissioned Officers before moving onto oversight and Army Skills Instructor training in section seven. Section eight will provide an alternative view on the role of Phase 1 initial training. Finally, section nine will provide some useful links. The Infantry (e.g. Parachute Regiment). Combat Capability Directorate: consisting of the RAC, Household Cavalry & Infantry (encompassing Mounted Close Combat and Dismounted Close Combat). Combat Support Capability Directorate: consisting of the Royal Artillery & Royal Engineers. Combat Information Capability Directorate: consisting of the Royal Corps of Signals and the Intelligence Corps. Combat Service Support Capability Directorate: consisting of the Royal Logistics Corps and Royal Electrical and Mechanical Engineers. The British Army is made up of both Commissioned Officers and Other Ranks (known as Soldiers). The Common Military Syllabus (Recruits) (CMS(R)) for training adult recruits was introduced in 1974 to replace the existing All Arms Basic Recruit Training Syllabus 1967, and this resulted in the creation of the Common Military Syllabus Part 1 Recruits 1976. In 1983 the Groom Report on the Army’s Individual Training Organisation was published and it recommended a review of both initial recruit (Phase 1) and specialist (Phase 2) training to restrict training to the minimum required to prepare a recruit for the first two years at regimental duty. As a result Phase 1 training was reviewed and a new Phase 1 syllabus was introduced on the 01 January 1985. A number of reviews have taken place since 1985 and subsequently the CMS(R) was reviewed by the Initial Training Group (ITG) in 1995 and the syllabus was amended in 1996 to reflect the changes. Common Military Syllabus (Standard Entry) Course. The induction of any recruit (officer or other rank) into the Army is one of the most important phases of their military career. The experience and attitudes they gain during this time will help to form the soldier’s character and approach to the Army. It is critical for initial (Phase 1) training establishments to ensure that soldiers under training become proficient in the basic skills required by every soldier. The training emphasis should be on progressive development and achievement throughout the initial training programme. With regards to training establishments, the British Army’s initial military training landscape has undergone a number of changes over the past 20 years. Figure 1, below, presents the ‘current’ (February 2014) British Army Phase 1 initial military training landscape. Figure 2, below, presents the British Army’s Phase 1 initial military training by age, entry type and location. Figure 1: British Army Phase 1 initial military training landscape. Figure 2: British Army Phase 1 initial military training by age, entry type and location. Junior entry infantry soldiers receive Phase 1 training at the Army Foundation College (Harrogate), then move on to the Infantry Training Centre (Catterick) to complete their Phase 2 training. The school of infantry conducts combined Phase 1 and Phase 2 training for all standard entry infantry soldiers on the six-month Combat Infantryman’s Course. Also conducts Army Reserve training on the Trained Soldier’s Courses Alpha and Bravo (TSC(A) & TSC(B)). As Figures 1 and 2 demonstrate, initial soldier training is conducted at a number of training centres – corporately termed Defence Training Establishments – around the country, and where an individual conducts their initial soldier “Phase 1” training will depend on how old they are and which job they will be doing. Basic recruit or Phase 1 initial training comprises the Combat Infantryman’s Course (CIC) for the Infantry and the Common Military Syllabus (Recruits) (CMS(R)) for all other British Army regiments and corps. Soldiers who are between 16 years and 17 years 5 months will be classified as Junior Entry (JE) and attend the Army Foundation College (AFC) in Harrogate. Soldiers older than 17 years 5 months will be classified as Standard Entry (SE) and attend a course at the Army Training Centre (ATC) in Pirbright, Army Training Regiment (ATR) in Winchester or the Infantry Training Centre (ITC) in Catterick. All officers, regardless of role, will complete their initial training at the Royal Military Academy Sandhurst (RMAS) in Camberley. The Director General of Army Recruiting and Training (DG ART), a Major General (OF-7), is the head of the Army Recruiting and Training Division. DG ART is responsible for ensuring that sufficient men and women of the right quality are recruited and trained to meet the needs of the service. The ARTD headquarters is based at Upavon in Wiltshire, close to many of the training units. Recruiting is carried out from over 100 locations in towns and cities throughout the country, and individual training is conducted at some 40 schools. With a permanent staff of about 12,000 across the whole of the recruiting and training organisation, the ARTD is responsible for Ministry of Defence (MoD) land, buildings and field assets valued at more than one and a quarter billion pounds. The ARTD is required to enlist about 12,000 recruits each year and to train a total of about 100,000 officers and soldiers (although this will reduce due to the implementation of Army 2020). The ARTD conducts almost 1,500 different types of courses, with over 6,000 actual courses run each year. There are over 10,000 officers and soldiers under training at any one time. Across all training phases, the average annual unit cost of training a soldier or officer is estimated to be in excess of £19,000. During the 2013/2014 training year the ARTD was re-subordinated back to the Adjutant General’s Corps (AGC) from the Commander Force Development and Training (FDT), both under the command of a Lieutenant General (OF-8), and at the same time absorbed the Collective Training Group (CTG). As part of the ARTD, the Initial Training Group (ITG), commanded by a Brigadier (OF-6) is responsible for the Phase 1 initial training of the majority of the British Army, both Regular and Reserve. All SE (over 17.5) infantry training is conducted by the School of Infantry at the ITC in Catterick. The school conducts combined Phase 1 and Phase 2 training for all infantry on the six-month CIC. Three ATRs deliver SE (over 17.5) training, two at Pirbright and one in Winchester. In addition, JE soldiers (aged between 16 and 17.5) are trained at the AFC in Harrogate. A ‘Long’ 49-week course (including eight weeks holiday) for those joining the infantry, Royal Armoured Corps/Household Cavalry, Royal Artillery and some Royal Logistic Corps roles. A ‘Short’ 23-week course (including three weeks holiday) for those joining courses with longer Phase 2 training – these are Royal Electronic and Mechanical Engineers, Royal Engineers, Royal Signals, Royal Army Medical Corps, Army Air Corps and some Royal Logistic Corps roles. AFC Harrogate is for all Junior Entry recruits who must be aged between 16 years and 17 years and 5 months when they start training. The Army Foundation College, Supervisory Care Directive (2014-09-08) provides the reader with a general outline of the ‘background’ improvements that have made/introduced to the AFC. The Short course delivers basic training to the Junior Soldiers of Burma and Alamein companies before they leave to follow their longer and more specialist technical training. While at the AFC Junior Soldiers also have the opportunity to gain Non-Vocational Qualifications (such as a City & Guilds apprenticeship at Level 2) in English, Maths and ICT (incorporating Functional Skills) as well as driver theory training. Many will also achieve a Duke of Edinburgh award. Junior Soldiers work on their leadership and team skills as part of the AFCs personal and team development package; undertaking a number of adventurous training activities, as well as physical and mental challenges, culminating in a 30 hour challenge patrol across the Yorkshire Dales. The Junior Soldiers are also given the opportunity to sample a wide variety of sports promoting fitness and agility. The final exercise, which may take place in sunny Scotland, is the culmination of field-craft and military skills training learnt during the courses. 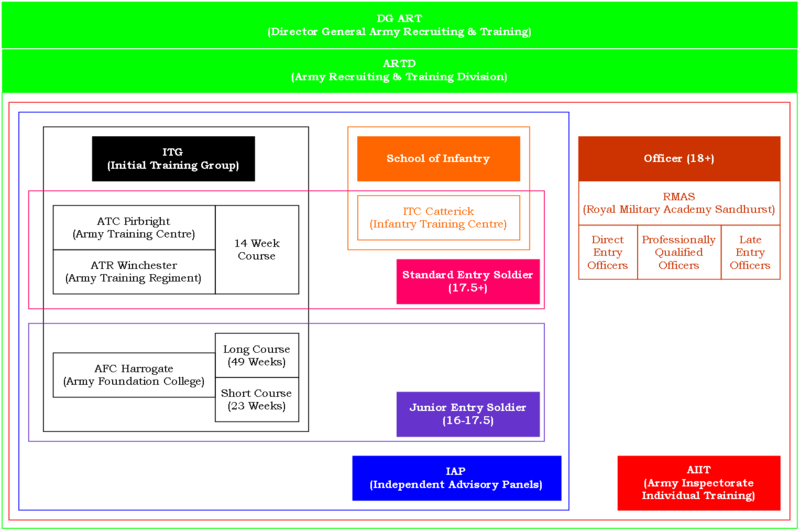 There are five Training Companies (Table 1) at the AFC and each Company is made up of five or six platoons, each of which is divided into four sections. It is here that Junior Soldiers first learn how to become a soldier and to work as part of a team. Each platoon named after events in the North African desert campaign. Each platoon named after events in the Burma campaign. Each platoon named after VC winners in the battle of Cambrai. Each platoon named after events in the Peninsula campaign. Since the 2013/2014 training year, the AFC(H) has gained another Company. Fox Company, formerly the PAT Wing and named after Colonel Sir George Malcolm Fox, is a physical development (PD) company commanded by a Major (OF-3) of the Royal Army Physical Training Corps (RAPTC) (Hendrickson, 2014). Fox Company is based around the Physical and Recreational Training Centre (P&RTC) and provides exercise rehabilitation as well as P&RT. Fox Gymnasium at the Army School of Physical Training is also named after the Colonel. Officer Commanding (OC): a Major (OF-3). Second in Command (2IC): a WO1 (SMI), Warrant Officer Class One, Sergeant Major Instructor. Imjin Platoon Sergeant: a WO2 (CQMS), Warrant Officer Class Two, Company Quartermaster Sergeant. CSM, QMSI P&RTC: a WO2, Quartermaster Sergeant Instructor. Imjin Platoon OC: a Captain (OF-2). Duke of Edinburgh Coordinator: SSgt (SSI), Staff Sergeant (Staff Sergeant Instructor). OIC L&IT: Officer in Charge. Table 2 provides an outline of the training regimen at AFC Harrogate. This training teaches recruits how to live and fight in the field. Recruits start with the basics of constructing a shelter, cooking, maintaining themselves and their weapon, and personal camouflage. Later, recruits master spotting the enemy and how to indicate targets, patrolling skills, obstacle crossing, and fire and manoeuvre as part of a team. Recruits are introduced to the 5.56mm rifle, how it works and how to strip it and clean it. In later lessons recruits are taught how to hold and aim, moving with the weapon and fighting with a bayonet attached. Once the basics are mastered, recruits fire the weapon from different positions at various ranges up to 300m. Throughout the course recruits carry out a wide range of physical activities which challenge them at a workable pace. Lessons are varied and progressive, with endurance runs, use of a fully-equipped gymnasium, climbing walls and swimming sessions. Recruits also carry out Battle PT (physical training) and tackle the assault course. The Army operates by a set of strict values and standards which instils pride, professionalism and discipline in our men and women. Recruits learn not only what the values and standards are, but more importantly what they mean, and how they apply to their conduct. Our values and standards are what make the difference between a civilian and a soldier, and are a pivotal part of Army life. Recruits are taught about the varied roles of the Army in deployed locations across the world. This helps recruits understand their own role and those of the unit they have chosen to join, and allows them to see the many different places they can look forward to seeing in the future. This part of the syllabus introduces recruits to basic first aid as well as treatment of injuries specific to the battlefield. Recruits learn in a classroom before practicing their skills in realistic training. Many of the skills learned can help save lives, either in the Army or while off duty. Maintaining a healthy lifestyle allows recruits to function well and minimises the chances of illness or injury. During this part of the course recruits receive advice on diet and nutrition, looking after themselves in hot and cold environments, and how to prevent injuries. Education is an important part of the training programme at AFC Harrogate. It supports the Junior Soldier through their training and it contributes to making a more effective soldier. Table 3 provides an outline of this education. All Junior Soldiers on the Long course are enrolled onto the British Army Apprenticeship which is an Intermediate Level 2 Information Communication Technology (ICT) qualification. As part of this qualification Junior Soldiers take exams in Functional Skills English, Maths and ICT, and complete an ICT Diploma.The AFC is supported by well-qualified civilian tutors who guide Junior Soldiers through their vocational education course. Whatever level of educational achievement a Junior Soldier arrives with, they will acquire additional skills and qualifications, and if a Junior Soldier needs additional learning support, this is available in class, in small groups and in one-to-one sessions in the Learning Support Centre. Wherever possible, the learning materials used in the classroom involve real military documents, exercises and working situations. Junior Soldiers on the Short course undertake a programme of education that is dependent on the qualifications they obtained before arriving at the AFC. All Junior Soldiers (both on the Long and Short course) undertake military studies. This teaches them about the structure of the British Army and its place within society. It also looks at the various roles that the British Army performs in the UK and overseas. ATC Pirbright delivers a 14-week progressive training course (known as the Common Military Syllabus (CMS(R))) over two seven-week terms, separated by a long weekend. The course is completed by all adult (age 17+) soldier recruits when they join the British Army. The focus is on coaching and mentoring to help recruits complete the course and move on to Phase 2 training where they learn the specific skills for their chosen trade. ATC Pirbright has a throughput of approximately 4700 recruits per year. ATC Pirbright consists of two ATRs each with four units and a mixture of sub-units as highlighted in Table 4 below. The Company is named in General Sir Mike Jackson’s honour. The Company is named after Captain Noel Godfrey Chavasse, VC and Bar, MC (9 November 1884 – 4 August 1917). He was a doctor and British Army officer, and one of only three people to be awarded a Victoria Cross twice. All Troops are named after Victoria Cross winners linked to the Combat Service Support area throughout the ages. The Squadron is named after Lieutenant General Sir John Sharman Fowler, who was the first Signals Officer in Chief of the newly formed Royal Corps of Signals in 1923. As part of the CMS(R) recruits will undertake a values-based leadership module at the Soldier Development Wing (SDW). The SDW is set in the heart of Wales and challenges recruits by exposing them to a demanding and arduous environment with the aim of promoting achievement and self-development. Led by example, recruits are inspired to display initiative and develop their own style of leadership to overcome these challenges. The SDW is an adventure training establishment (outward bound activities centre) set in Sennybridge, Brecon. Recruits visit SDW during week 10 of the CMS(R) course. The test at SDW is one of physical endurance, team work and a chance to develop outdoor skills and fitness. Journeys are carried out in mountain, river, underground and coastal areas. Within these environments, a safe training environment is provided by the staff with the perception of danger together with scenarios that present the opportunity to demonstrate the core values of commitment, courage, discipline, integrity, loyalty and respect for others. There are also opportunities for recruits to develop their leadership skills in an inspiring, yet caring, environment. The outline of the training regimen at ATC Pirbright is the same as at AFC Harrogate (see Table 2 above). Table 5, below, provides a weekly overview of the military training at ATC Pirbright. Attestation (a formal ceremony to join the British Army), kit issue, administration, weapons training and Exercise Icebreaker (the first night out on exercise). Weapons training, drill and first aid. Fitness training, first aid and platoon activities day. Exercise First Night over 2 nights followed by Exercise Realities of War – a trip to military museums in London & Portsmouth. Map reading, first aid, fitness training. Phase 2 Visits (a chance to see where you are going next and meet others like you who have already passed out), drill test, families’ day (a chance for your family to come and visit you) and a long weekend. Exercise Halfway (three nights out of camp) and compulsory drugs testing. Bayonet Fighting and long range firing. Adventurous training in Wales (caving, climbing, canoeing and hill walking). Annual Combat Marksmanship Test (ACMT). Field craft tests, arms drill and physical fitness tests. Exercise Final Fling (a one week exercise, practising all of the skills learned) plus fire, movement and map reading tests. Arms drill and sports culminating in a prestigious passing out parade in front of family, friends and unit representatives. Physical development (PD) for recruits is via the Physical Training (PT) Wing led by a WO2 from the Royal Army Physical Training Corps (RAPTC). The WO2 is aided by over 40 staff comprising All Arms Physical Training Instructors (AA PTIs) and qualified civilian fitness instructors (typically ex-service) who collectively deliver approximately 96 lessons of PT to each course during their 14-weeks of training (Leare, 2014). The ATR (W) also conducts Army Reserve training on both the Trained Soldier’s Course (Alpha) (TSC(A)) and the Trained Soldier’s Course (Bravo) (TSC(B)). The ATR (W) has four squadrons as highlighted in Table 6 below. Responsible for administration and rehabilitation. The outline of the training regimen at ATR Winchester is the same as at AFC Harrogate (see Table 2 above). Table 7, below, provides a weekly overview of the military training at ATR Winchester. Attestation (a formal ceremony to join the British Army), kit issue, administration, values and standards training and Exercise Icebreaker (a night outside on exercise). Weapons training, fitness training and drill. Weapons training, fitness training and first aid. Exercise Realities of War, live firing and swimming. Exercise First Step (over two nights) and sport. Live firing, navigation exercise and sport. Drill test, cap badge issue and Parents Day. Live firing and live firing tests. Test exercise and Commanding Officer’s (CO’s) Competition. Exercise Final Fling – a one-week exercise, practising all of the skills learned – plus fire, movement and map reading tests. Arms drill in preparation for a prestigious Passing Out Parade in front of family, friends and unit representatives. The Infantry Training Centre (ITC), in Catterick, trains all the British Army’s infantrymen, producing some of the best infantry soldiers in the world. It is the largest military training establishment in Europe and trains approximately 25% of the recruits joining the British Army (roughly 5000 recruits per year), with a standing population of over 2000 recruits and around 900 permanent (instructional and support) staff. Junior Entry infantry soldiers (aged 16-17) receive Phase 1 training at the Army Foundation College Harrogate, then move on to ITC Catterick to complete their Phase 2 training. ITC Catterick runs four versions of the CIC: Line Infantry; Foot Guards; Para’s; and Gurkha. ITC Catterick consists of three Battalions (ITC Support Battalion (ITC SB), 1st Infantry Training Battalion (1 ITB) and 2nd Infantry Training Battalion (2 ITB)) as highlighted in Table 8 below. Delivering Phase 2 training for the Infantry element of the Army Reserve. The Parachute Regiment Training Company is the only unit that trains individuals that want to be Paratroopers (PARAs). It is made up of seven training platoons: Arnhem; Athens; Breville; Bruneval; Normandy; Oudna; and Rhine. All platoons are named after significant battles that The Parachute Regiment took part in during World War 2. The Guards Training Company is responsible for the Foot Guards CIC with approximately 10 platoons and trains recruits from all five Foot Guards Regiments – Grenadiers, Coldstream, Scots, Irish and Welsh. The Foot Guards course is two weeks longer than the Line Infantry CIC. The extra time is spent covering ceremonial foot and arms drill training, which enables Guardsmen to move straight from training to ceremonial duties in London. The Gurkha Company is made up of six platoons commanded by Nepali Gurkha officers. The Company is commanded by a British Major from the Royal Gurkha Rifles. The remainder of the training staff are drawn from across the Brigade of Gurkhas, with the majority coming from the infantry units. The course is 37-weeks long, takes a Nepali youth and moulds him into a British Army soldier. Anzio Company is made up of four platoons, each of which is named after the location of a significant battle: Ypres; Chindit; Barrossa; and Crimea. The Company name is derived from the Anzio landing of 22-29 January 1944. Note: Hook Company is named after Private Alfred Henry Hook VC who was awarded the Victoria Cross following the action of 22/23 January 1879 at Rorke’s Drift, Natal Province, South Africa. The Combat Infantryman’s Course: Line Infantry builds up recruits’ skills and fitness through a progressive training programme. In simple terms, this involves learning individual skills first, followed by team/section skills and then platoon skills, ending with an assessment. During training, recruits are taught the importance of discipline, integrity, loyalty and respect for others. They learn that being a soldier is about putting others first and having the courage to do the right thing in any given situation. Table 9 provides an outline of the training regimen at ITC Catterick. Personal administration means everything to do with looking after self and kit, in the field as well as in camp. The more organised a man is, the easier he will find it to live like a soldier. Recruits learn how to handle the SA80 rifle, the Light Machine Gun and the General Purpose Machine Gun, as well as how to use night viewing devices. They start on simulators before moving on to ranges and field firing exercises. There’s a five-day live firing exercise at the end of the course. Drill means military procedures and movements, such as marching and parading. Learning drill makes a soldier disciplined and teaches him to take pride in his appearance and manner. The Pass Out Parade at the end of training is a public demonstration of these skills. These are the basic skills a soldier needs to work and survive in the field. Areas covered include camouflage and concealment, map reading, observation, first aid and defence measures. Skills are tested in exercises during the course, culminating in a final exercise. There’s lots of exercise in the course including sports, running, gym work, swimming, the assault course and general physical training. Fitness is very important. The training is tough, so it is important that recruits get in shape before they arrive at ITC Catterick. The fitter they are, the easier it is. It’s vital that recruits do not let their fitness slip between selection and arrival at ITC Catterick. Adventurous Training (AT) is an important part of the course, comprising of challenging outdoor activities, such as abseiling, kayaking and rock climbing. All these improve a soldier’s teamwork and initiative. Soldiers work as a team, so it is important everyone shares the same values. The Pass Out Parade at the end of the course is often one of the proudest moments in a soldier’s life. But even then, the challenge will be only just beginning. They must go on to understand what being an infantryman really means, and how they fit into the bigger picture of military life and operations. The Combat Infantryman’s Course: Foot Guards builds up skills and fitness at a gradual pace. This involves learning individual skills first, followed by Section and then Platoon skills, ending with an assessment. During training, recruits are taught the importance of discipline, integrity, loyalty and respect for others. They learn that being a soldier is about putting others first and having the courage to know the right thing to do in any given situation. This version of the Combat Infantryman’s Course is two weeks longer than the Line Infantry version. Drill is covered in greater detail, bearing in mind the importance of the Ceremonial Duties undertaken by the Household Division. In general terms, the Life Guards training regimen is the same as the Line Infantry (Table 9) except for the Pass Out Parade. The Passing Out Parade at the end of training is a public demonstration of these skills. The Parade is based on a mini Queens Birthday Parade (Trooping the Colour) that is conducted yearly in June at Horse Guards Parade in London in front of HM Queen Elizabeth II. A week by week overview of the Life Guards CIC is given below. The Combat Infantryman’s Course: PARA builds up soldier recruits’ skills and fitness bit by bit. In rough order, this involves learning individual skills first, followed by team/section skills and then platoon skills, ending with an assessment. During training, recruits are taught the importance of discipline, integrity, loyalty and respect for others. They learn that being a soldier is about putting others first and having the courage to do the right thing in any given situation. This version of the CIC is two weeks longer than the Line Infantry version. Greater emphasis is placed on fitness, bearing in mind the higher fitness standards of the Parachute Regiment. In general terms the PARA training regimen is the same as the Line Infantry (Table 9). For a week by week overview of the PARA CIC see below. Combat Infantryman’s Course by Week for the Life Guards and Parachute Regiment. More than 80% of officer cadets at the RMAS are university graduates, but some arrive with A-levels or equivalents. Others are serving soldiers who have been selected for officer training, and some come from overseas, having been chosen by their own country’s army to train at the world famous Academy. People cannot undertake training at their own private expense. The Commissioning Course for Regular Army officers is 48-weeks long, including recess periods. It runs three times a year, starting in January, May and September. The Army Reserve course is shorter, as is the training course RMAS offers military personnel with professional qualifications in areas such as law and medicine. Training at RMAS covers military, practical and academic subjects, and while it is mentally and physically demanding, there is also plenty of time set aside for sport and adventurous training. It is a proud day for officer cadets going into the Regular Army when they finally march up the steps of Old College to be commissioned as officers at the end of the prestigious Sovereign’s Parade. At the end of the course a newly-commissioned Officer will be qualified to lead and manage soldiers while at the same time upholding the British Army’s core values of selfless commitment, respect for others, loyalty, integrity, discipline and courage. The days of RMAS being full of cadets educated at private schools have passed and now more than 50% of cadets come from state-funded education, with approximately 80% holding university degrees. There is normally one female platoon per intake. To train Officer Cadets in the basic skills and battlefield disciplines of soldiering. 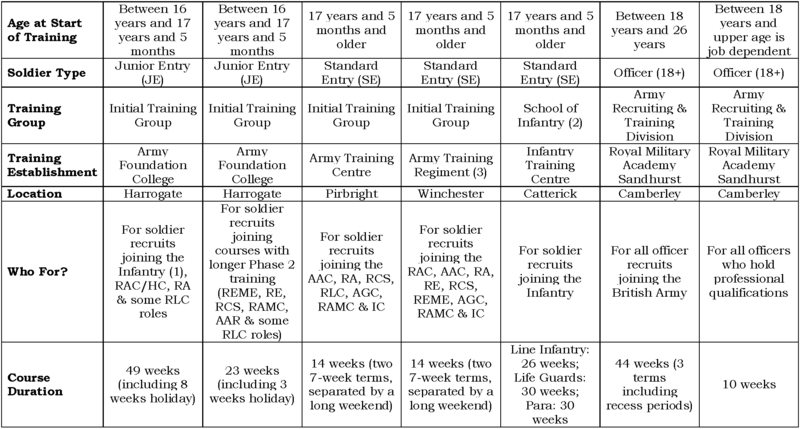 Training at RMAS is divided into three 14-week terms, as outlined in Table 10 below. Acquisition of basic military skills as cadets transform from civilians into soldiers, focusing on teamwork and building confidence. Exercise Long Reach, a 36-hour patrol competition in the rugged terrain of Wales. During the three or four week recess at the end of Week 14, all Officer Cadets go on a one week Adventurous Training (AT) course outside the Academy. During this AT they earn a qualification which enables them to organise and lead an AT expedition of their own at the end of Term 2. A move towards developing Officers rather than raw recruits. The emphasis of training turns more to leadership, initiative and the role of the Officer. Officer Cadets start to spend more time in Faraday Hall, the academic wing of RMAS, studying subjects like conventional war, international affairs and leadership psychology, but there are still plenty of tough, demanding field exercises. This is the term in which Officer Cadets have to make a final decision about which regiment or corps to join; Selection interviews start in Week 12. Throughout this term Officer Cadets do the detailed planning for the Adventurous Training expedition they will go on during the first week of recess. Shift in focus from learning about conventional war to different kinds of operations, such as counter-insurgency and peacekeeping. Directing Staff give Officer Cadets more responsibility, it is now up to the cadets to motivate and organise themselves, stay fit, arrange sporting activities and plan fund-raising events such as charity balls. Again, Officer Cadets take part in demanding and realistic field exercises which include live firing. In just a few weeks some of them will be deployed on operations under the flag of the UK, the UN or NATO. Within about six months of leaving RMAS, everyone will go on to a Young Officer’s (Phase 2 training) course to learn the disciplines and craft of their chosen part of the Army before eventually becoming Platoon Commanders ready to lead soldiers. The final term ends in a flurry of returning kit to the stores, packing boxes, collecting the last pieces of new uniform and getting ready for the world famous Sovereign’s Parade in front of Old College. Family and friends come from far and wide to join in the celebrations that mark the end of a tough but immensely fulfilling year at RMAS and the award of The Queen’s Commission as proud new British Army Officers. Build teams (self direction, develop cohesion, raise standards & empower). As well as the traditional classroom-based and practical-based methods of teaching and subject delivery, RMAS also utilises a virtual learning environment (VLE). VLE enables students at all stages of training to take more ownership and responsibility of their learning objectives (e.g. pre-learning, self-assessment and consolidation). The full cost of a single trainee on the Commissioning Course at RMAS for 2012/13 to 2014/15 was assessed as: 2012/13 £90,049; 2013/14 £92,300; and 2014/15 £93,673 (FOI Request). The Professionally Qualified Officer (PQO) course at RMAS is for new British Army Officers who hold professional qualifications, such as doctors, vets, lawyers, dentists, nurses, physiotherapists and chaplains. The course is designed to familiarise PQOs with military life and to prepare them for operational deployment. The course takes ten weeks to complete and is based directly on the Regular Commissioning Course. The focus is on officer-ship, command and leadership, and the syllabus includes field training, physical training, weapons training and drill. When not out in the field PQOs will find themselves in the classroom, learning, for example, about global security, aspects of leadership psychology and the history of warfare. Some of the most exciting parts of the course are the tactical exercises, a week on the ranges firing the Army’s latest weapons systems, learning how to use the latest digital communication equipment and the physical challenge of core survival skills. The Final Exercise centres on operating in a contemporary environment and contains elements of peace support operations, war fighting, and negotiation and media operations. The final hurdle is the preparation for the Passing Out Parade. The night before, a formal dinner is held in the magnificent surroundings of the Indian Army Memorial Room in Old College, where everyone wears mess kit for the first time. The next day the PQOs march out to pay their last visit to the parade square with the support of a military band and the parade commander on horseback. Afterwards, family and friends are invited into Old College to join in the celebrations at the parade lunch. A Late Entry (LE) Officer is someone who has been awarded the Queen’s Commission after a number of years’ prior service in the Army as a soldier. Leadership is a key theme of the LEOC and students are encouraged to develop new knowledge and skills while building on their previous experience in the Army. A highlight of both the Regular and Reserve courses is a day-long private visit to the Houses of Parliament and the Ministry of Defence in order to carry out research as part of a DIA project. Once the LEOC has been successfully completed LE Officers follow the same training and education strand as Direct Entry Officers. Independent Advisory Panels (IAP) can be found at all of the British Army’s initial training establishments. Each IAP provides an independent source of advice, encouragement and support. It exchanges information, provides feedback and assists in identifying possible areas for improvement at its training establishment. The IAP also acts as a route for external communication and promotes the British Army’s reputation locally. Additionally, it acts as a source of feedback on local issues. The panel does not override the British Army’s principle of self-regulation which is vested in the Commanding Officer (CO) and the higher chain of command. Further, IAPs do not have responsibility for budgets, objective setting, policy or staff selection. Each individual IAP meets regularly and also undertakes individual activity visits. A number of these reports for the various training establishments can be viewed below. To check the implementation of extant Defence and Army policies relating to the training environment. There are a number of external organisations and institutions that are, or have been, involved in the regulation and oversight of the British Army’s Phase 1 initial training system. All military instructors (known as Army Skills Instructors) at Phase 1 training establishments are required to successfully complete two mandatory courses and encouraged to gain other optional qualifications (Table 11). Army Skills Instructors at the RMAS are required to successfully complete a considerable number of courses prior to attending the 5-week RMAS Instructors Cadre course, as highlighted in Table 11 below. Every year approximately 30 Colour Sergeants/Staff Sergeants (OR-7) are selected to train the next generation of officers. RMAS Instructor Cadre hopefuls are tested in all areas to assess their suitability to work with Officer Cadets, from physical fitness to instructor capabilities. Completion of all the required courses takes approximately 2-3 years of hard work. The DTTT v2, DIT and DTTT(C) courses (now superseded by the Army Instructor Capability programme) are delivered by the ARTD Army Staff Leadership School at Alexander Barracks in Pirbright. The Army Staff Leadership School (ASLS) has the task of training the Army’s trainers, from Corporal section commanders and trade instructors to Commanding Officers, as well as administrative and support staff. The ASLS opened in 2007 and trains approximately 2,400 military and civilian training, supervisory and support staff each year. The AA SAA instructor course is delivered by the Infantry Battle School in Brecon, Wales. The DTTT course is also mandatory for Army Skills Instructors at Phase 2 and 3 training establishments. Cost of RLC Driver Phase 1 Training: £21,000. Leare, C.R. (2014) Army Training Centre Pirbright (ATC(P)). Mind, Body and Soul: The Annual Journal of the Royal Army Physical Training Corps. Number 97, 2013/14, pp.92. Hendrickson, G.C. (2014) Army Foundation College (Harrogate) (AFC(H)): PAT Wing to Fox Company. Mind, Body and Soul: The Annual Journal of the Royal Army Physical Training Corps. Number 97, 2013/14, pp.89-90. Do you always have to go to war if you sign up to do all Military training with you? Son wants the military training and discipline and life structure side of it but does not want to be a soldier or ever have to go or be forced to go to war because you trained? I would say all childhood he was very much surrounded by women and out of a family with about 10 women and him being the only boy, so you can imagine. He want to train to be an independent man with all life skills a man should have to be able to take instructions, discipline, bed making the military way, all indoors life and outdoor life in the army/ airforce or what ever, motivation, structure, hands on , fixing bits and bubles in the house. Basically everything a man his age should be doing, balance in life , personal life, soul life, work, home, family, friends, party and still be able to work the next day etc. The definition and criteria for Conscientious Objection varies between militaries. Two examples are linked below. 1. Canadian Armed Forces (2015): http://www.forces.gc.ca/en/about-policies-standards-defence-admin-orders-directives-5000/5516-2.page. 2. British Army (2011): http://www.parliament.uk/documents/joint-committees/human-rights/briefing_from_forces_watch_conscientious_objection.pdf. If you don’t want to be a soldier, why join the military? Although the military will, among other skills, develop life skills, the development of these skills starts in the home, whether by men or women (e.g. parents, siblings, cousin, grandparents). At a pass off parade troops show their skills with arms. When they form up for final inspection, with arms, they are probably at the slope. My question is, if any or all of them are presented with awards or graduation certificates, how is this done shipshape. The recruit has only one hand free, the other is busy with his/her rifle? Troops are not physically presented with awards/certificates whilst conducting weapons drill. Sorry, I do not currently have a timetable for the Military Police. My son was due to pass out at ATR winchester this April the 24th but due to an Injuary he has been back squadded. When is the next pass of parade any help would be appreciated. Unfortunately, I do not know the exact date of pass off parades. However, once your son has recuperated from his injury, he will then return to normal training and progress to his pass off. Training start/end dates are planned in advance and once your son knows which troop/squadron he will be with, he will know his pass off date.